The venue for the very first Aqpik Jam was at the newly built Kuujjuaq Forum with its arena and gymnasium. 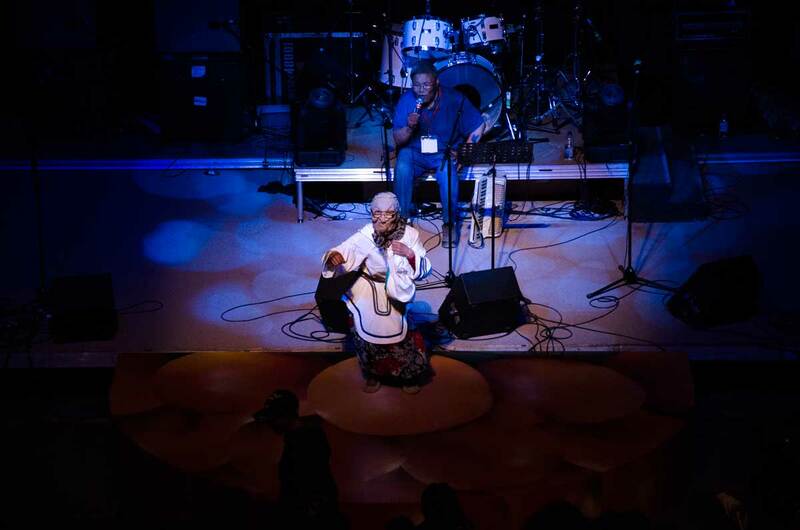 The festival was hosted at the Kuujjuaq Forum until 2002 when the venue was moved to the newly built Katittavik Town Hall and Cultural Centre with its 500-seat capacity, better sound acoustics, and improved lighting and audio equipment. The Aqpik Jam Music Festival is held during the second week of August to coincide with the ripening and harvesting of the wild berry called aqpik. The festival lasts four days with a full-slate of performances every evening from 7:30 p.m. to early in the morning. Aqpik Jam is a special opportunity for many Northern musicians to perform for the public, showcasing their talents whether in the sphere of traditional, contemporary, gospel, country or rock music. Aqpik Jam is also an opportunity for families who haven't seen one another for a long time to reunite and have some good-ol' fun. Many now-recognized performers had their start at Aqpik Jam, including the Kuujjuaq Youth Group. The music festival was created to celebrate and acknowledge musicians with their roots in Inuit culture and has grown to include Canadian pop and tribute bands. Since 1996, the number of musicians, artists and tourists that come every year to Kuujjuaq for the Aqpik Jam Music Festival has steadily increased. In addition to nightly concerts, day-time activities are organized during Aqpik Jam. Each year, for example, there is an aqpik berry-picking contest to see who can pick the most berries. That special person is recognized with a trophy and holds exclusive berry-picking bragging rights for the following year. Other day-time activities include a canoe race, as well as golf, dart, cribbage and poker tournaments. A community feast is also held every year at some point during the week's celebrations.